As every guide knows this began in September 1666 when a baker called Thomas Farriner failed to close down his oven in Pudding Lane by London Bridge. The resulting fire began to spread and the Lord Mayor of London Sir Thomas Bloodworth was summoned to the scene. 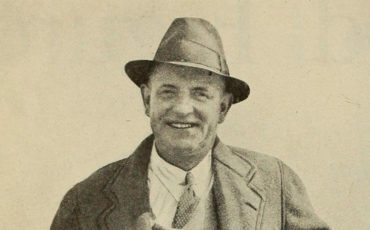 He had the authority to order the demolition of nearby houses but declined to do so and famously said that “a woman could piss it out”. London had endured a long hot summer and, before long, the fire began to rage out of control. The only way to stop fires in those days was to pull down houses to create fire breaks. It was assumed that St Paul’s Cathedral would be safe as there was a gap between it and the nearby buildings but the heat was so fierce that the flames jumped across and London’s great cathedral was soon in ruins. Archaeological research indicates that temperatures reached 1250 degrees centigrade at the height of the fire. 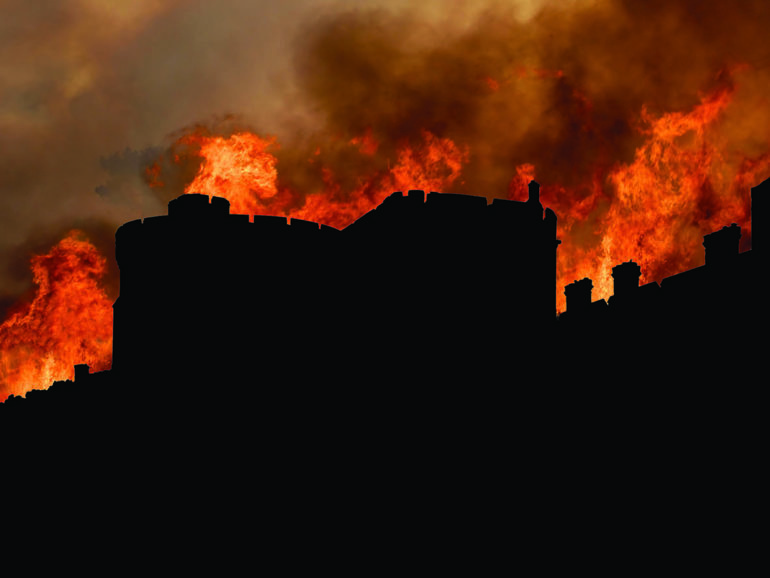 Eventually, the garrison at the Tower of London began to blow up houses to create a more effective fire break. The wind, unusually for London, was coming from the east to the Tower itself was not touched by the fire. There was a surprisingly low death toll. London was just getting over the Great Plague of 1665, which had claimed the lives of 100,000 citizens, around a fifth of its population. Nevertheless, 70-80,000 houses were destroyed and so many Londoners lost their livelihoods and their homes. Lector, si monumentum requiris, circumspice (Reader, if you seek his memorial, look around you). Painting of the Great Fire of London, with Ludgate and Old St. Paul’s. Artist in unknown. Photo Credit: © Public Domain via Wikimedia Commons. 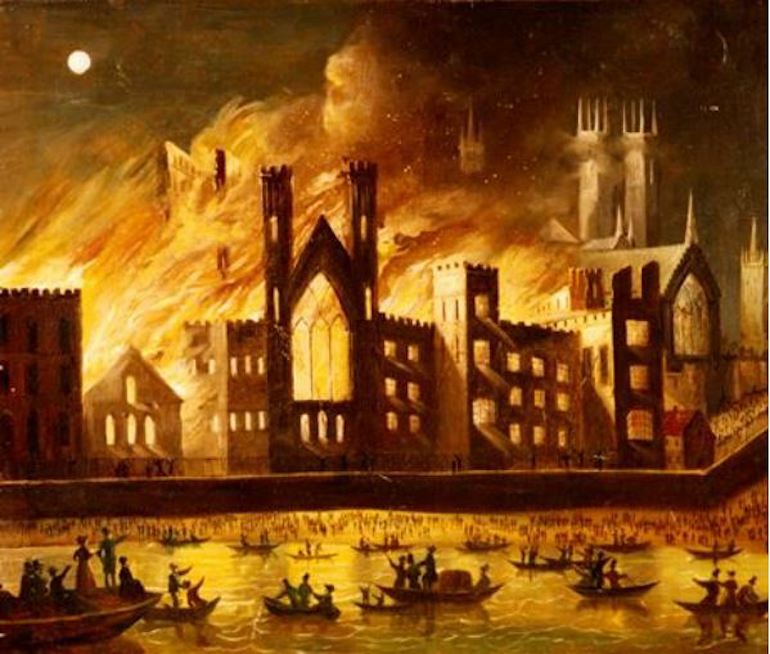 The Great Fire burned for five days but was stopped before it reached Westminster where the Houses of Parliament stand. However, in October 1834 a group of workmen were ordered to burn some wooden tallies which had been used for accounting purposes in the government treasury but were no longer needed. They did so in a furnace in the Palace of Westminster which was normally used for coal, a substance that burns more slowly in a fire which is easier to control. The heat generated by the burning wood spread through the pipes and, before long, the old Palace was consumed by flames. Westminster Hall and Westminster Abbey nearby were spared from the flames and still stand in all their medieval glory. Huge crowds of people began to congregate to watch the mother of parliaments as it burned down. One of these was the London born artist J M W Turner who recorded the scene in his sketchbooks and painted it in two canvases which, ironically, are now housed in museums in Cleveland and Philadelphia in the USA. 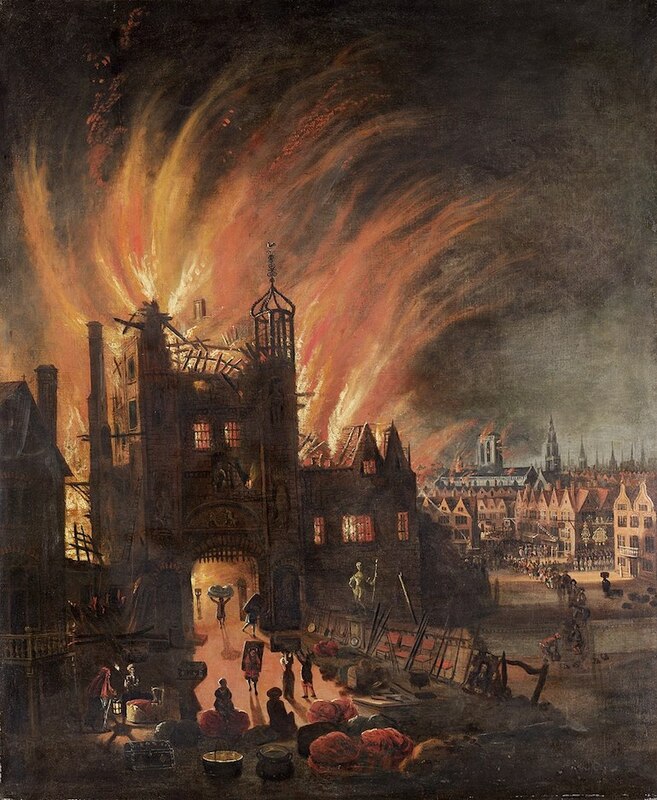 As with the 1666 fire, destruction led to rebuilding and to the opportunity for an architect to make his name. Sir Charles Barry rebuilt the Houses of Parliament with the help of the young and unknown Augustus Pugin who was responsible for the interior decoration. The most famous part of the rebuilt Palace of Westminster is Elizabeth Tower where the famous bell Big Ben is kept. (People always refer to the clock as Big Ben but it is, in fact, the name of the bell behind it.) Now Barry and Pugin’s Palace is starting to show signs of its age and is undergoing a rebuilding process which will take around ten years and cost over five billion pounds. Painting of the Palace of Westminster on Fire, 1834, by an unknown artist. Photo Credit: © Public Domain via Wikimedia Commons. Again it was a minor act of carelessness which caused a major fire. At around 11:15 in the morning of 20th November 1992 a high-intensity spotlight used to examine works of art was placed too close to some curtains in the Queen’s private chapel in Windsor Castle. The heat from the lamp set the curtains alight and the fire spread rapidly soon reaching temperatures of around 850 degrees centigrade. Two hundred firefighters and around a million and a half gallons of water (mostly from the nearby River Thames) were used to put out the Windsor Castle fire but not before the Brunswick Tower and St George’s Hall had been lost. There was to be no major alteration to the skyline of Windsor Castle but a large part of the interior needed rebuilding. 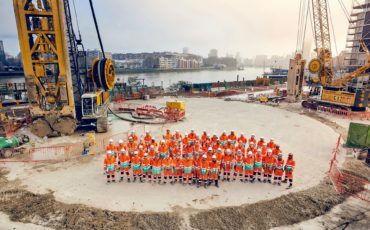 The cost of rebuilding was estimated to be around £60 million but the final bill was less than two-thirds of that, mainly because the firms involved were ‘encouraged’ to charge for their work at cost price (ie without any profit but at a rate high enough to pay their workers and supply materials). What they lost in revenue they made up for in the prestige of working for the royal family and rebuilding the Queen’s oldest home. Where did the money come from? Windsor Castle welcomes around a million and a half visitors every year and Blue Badge Tourist Guides who take groups there are used to long queues each morning. The proceeds from the entry charges (around £20 a head) and from the half million who go to Buckingham Palace during the summer opening are used to offset the costs and the Queen coughed up £2 million of her own money. 1992 also saw the failure of the marriages of two of her sons. No wonder Her Majesty later called it her ‘annus horribilis’.